Forest Lake is well positioned, where the Phewa Lake is only a doorstep away. 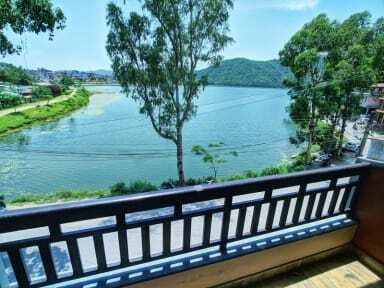 Means, you get to enjoy marvelous beauty of the lake while staying at our luxurious yet affordable hostel. Our place is definitely not a party hostel. Our main aim is to give you complete relaxation, also giving you atmosphere where guest can meet fellow travelers and share their trekking stories and advices. 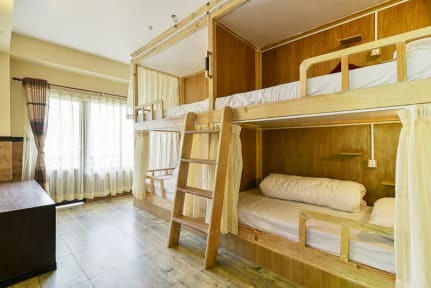 All the dorm beds have comfortable mattress, individual curtain, light, mini-fan & a power socket. We have a lovely hangout area at the terrace where you can see the infinity view of the lake also enjoying the lake breeze either by relaxing on a hammock or on the couch. There is a forest in the background which makes its surrounding green and fresh. We also have private rooms at affordable prices with rooms having private balcony and wonderful view of the lake. Fast free WiFi can be found through out the building as well as super cheap breakfast for when you can't bring yourself to venture out.